Don’t hide your love to Star Trek even when you’re in a business suit. Sounds cool? Then the following Star Trek: The Original Series Enterprise Ship cufflinks should catch your eye. This is a pair of exquisite cufflinks inspired by Star Trek: The Original Series. As we can see from the images, each the cufflink is shaped as the iconic starship USS Enterprise NCC-1701 from the universe of Star Trek, and the tiny Enterprise ship features subtle details, but silver coating makes them stylish enough to stay on your cuffs in order to flaunt your fandom in a decent way. 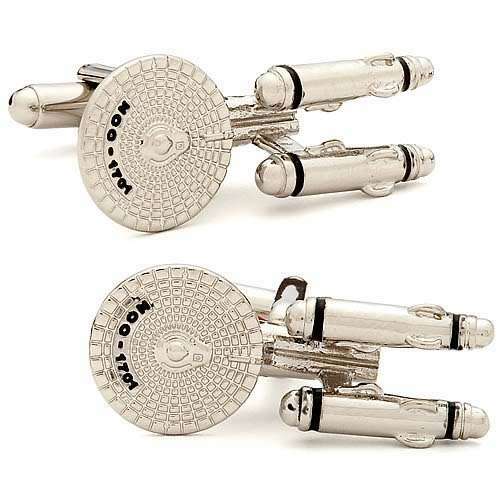 The pair of Star Trek Enterprise ship cufflinks is priced at $59.99 USD. If you’re interested, head to Entertainment Earth for more details. Additionally, if you want other options, you may like to check the LEGO sterling silver cufflinks and more cool stuff by following tags.